Located near Baltimore, Towson University is a comprehensive public institution with almost 17,000 undergraduate students of both the traditional and non-traditional varieties. Towson boasts a perennially strong women's gymnastics team and entertainment options abound in Baltimore - from the National Aquarium to Oriole Park at Camden Yards. Describe the type of student who should attend Towson University. Why? What is a typical Towson University student like? Describe the type of person that should attend Towson University. If you attend Towson University you are most likely to have a friend that goes there with you. Most people at Towson University only enroll if they know a friend that also attends Towson. What are the top 3 reasons someone should attend Towson University? What was a typical Towson University student like in high school? Describe the type of person that should attend Towson University. A typical Towson University student most likely went to school in the state of Maryland and did not get into the University of Maryland College Park. Some are hard working students and were probably not too involved with sports. Founded in 1866, Towson University is recognized among the nation's best regional public universities, offering more than 100 bachelor's, master's and doctoral degree programs in the liberal arts and sciences, and applied professional fields. Located in suburban Towson, eight miles north of Baltimore, our beautifully landscaped, 328-acre setting offers a pleasant environment for study and a diverse campus life, as well as easy access to a wealth of university and community resources. Towson University's educational experience branches out to off-campus locations throughout Maryland, including a number of online options. With more than 21,000 students, Towson University is the second-largest public university in Maryland. 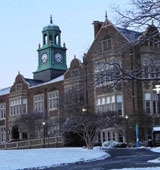 As a metropolitan university, Towson combines research-based learning with practical application. Our many interdisciplinary partnerships with public and private organizations throughout Maryland provide opportunities for research, internships and jobs. Towson University is a founding member of the Coalition of Urban and Metropolitan Universities (CUMU). What are the top 3 things that students do for fun at Towson University? The top 3 things students do for fun at Towson University are: rock climb, go to the movies, and go to parties. Campus housing is available for undergraduates. Housing deposit : $350.00. Housing deposit due : May 1. Housing deposit is not refunded if student does not enroll.. Freshman allowed to have car. No pets. The average student pays $13,945 for tuition, fees, and other expenses, after grants and scholarships. Total stated tuition is $5,830, in-state and on-campus, before financial aid. Learn more about financial aid at http://www.towson.edu/main/finaid/. Estimate the net price for you at http://www.towson.edu/main/finaid/netpricecalculator/npcalc.asp. The typical (median) early career salary of Towson University graduates is $42,900, according to Payscale. Towson University participates in the NCAA Division I-AA for college athletics. Want more info about Towson University? Get free advice from education experts and Noodle community members.